Every mum needs a stash of last minute meals and what could be easier than grilling some chicken breasts while you make a salad or steam some veges? And check out those Parmesan Encrusted Potato halves in the background (recipe coming soon!). Combine the oil, lemon juice and lemon pepper in a bowl. Add the chicken and allow to marinate for as long as you can. This does’t mean hours and hours, or overnight. Remember, it’s a last minute meal, and if left too long the acid in the lemon juice will start to cook the chicken and it will take on a white appearance, so we are talking 30 minutes to an hour here. 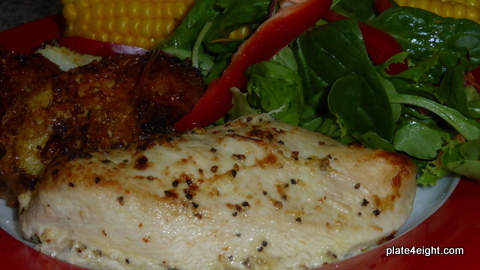 Sprinkle the chicken with parmesan cheese and grill or bake in the oven at 180C until the chicken is cooked through.